CSICon 2017 is all over, I will be writing about it in more depth soon, so stay tuned. CSICon might be over, but so much inspiration was gained and follow-up on opportunities remains to be done. I want to share this one thing with everyone. A tribute to James Randi. A little history first, in 2011 when I was still a member of the Independent Investigation Group (IIG) in Los Angeles, I had the idea of our group selling fake white beards as a tribute to James Randi at the Amaz!ng Meeting (TAM 9 From Outer Space). The group loved the idea and we researched and ordered hundreds of beards from China. Paula Lauterbach drew the cartoon face of Randi that we would use for the beard insert. We sold the beards for $5 each and Randi spent the rest of the conference autographing inserts as asked. We also arranged a group photo. Pulling anything like this together with a group this big in a conference room that is trying to get the stage set up for the next speaker is quite a chore. The first photo in 2011 barely happened. Randi had to be located; he entered the photo a couple minutes before it was taken, and whisked off minutes after to do interviews, magic or whatever The Amaz!ng One had scheduled next. I took this photo while standing on a table on the stage, which is why we have such a great angle. Podcaster (http://ohnopodcast.com/), and photoshop guru Ross Blocher, took this photograph and turned it into the final product you can find here. Also used on James Randi related Wikipedia pages. 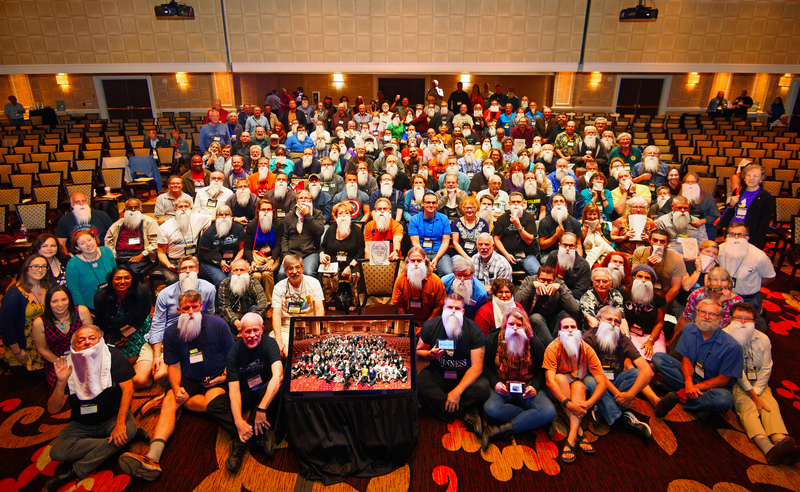 Six years later, 2017, the IIG found a few leftover Randi beards and was selling them at CSICon for $1 each. James Underdown suggested people meet in the conference area for a quick photo we would send to Randi. 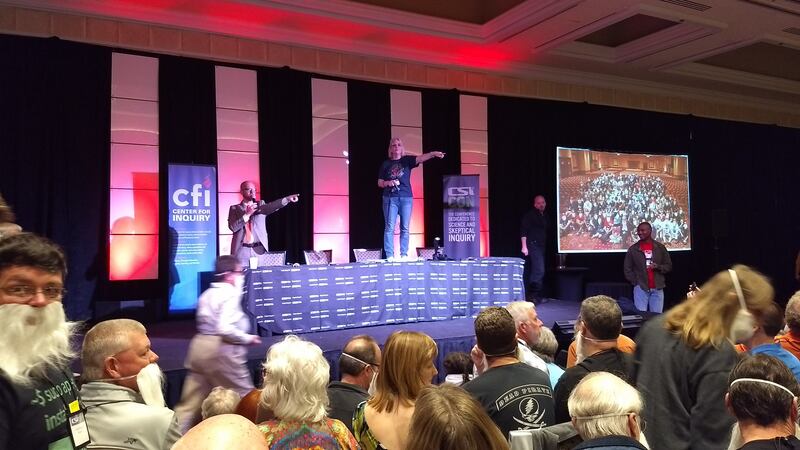 (Randi had been unable to attend CSICon due to health reasons). Our emcee George Hrab announced the day, time and location and suggested if you didn’t have a beard to use something that might look like a beard, a white washcloth or white napkin. Déjà vu all over again. I stood on a table on top of the stage and directed people into position for another group shot. Thankfully I thought to arrange for the 2011 photo to be displayed on the screen adjacent to the stage; you will see in the bottom of the 2017 photo. The Emcee, George Hrab, was standing on the stage next to me saying “Hurry up Susan, take the photo we need to move on”. And I was yelling at people to position themselves so I could see them clearly. At the last moment I added an empty chair (for Randi), and someone (wearing orange) held the insert, that Paula had drawn, on the empty chair. This year, I shot with a new camera that did not have a wide-angle lens. Photographer Brian Engler left me his camera before he jumped into the picture and I took a few photos with each camera. What you are looking at now is a composite photo. The people on the sides were from Brian’s camera and the main photo is from my camera. The photoshop skills of the talented Ross Blocher makes it look terrific. I’ve been having a lot of fun zooming in and looking at the detail of the audience. There are some very clever people in the photo which shows that skeptics are resourceful and fun. Kenny Biddle in the front with a “We Love You” message for Randi on his phone. Lots of napkins, washcloths, paper substitutes for the beard. One woman is holding her beige sweater as a beard, and two women use their own hair as a beard. One does a Cthulhu beard (front right). Mitchell Lampert (wearing orange almost in the back) has a picture of a beard on his phone and held the phone to his chin. Ross I see has “snuck” in the photo on the right (a perk of being the person doing the photoshopping). The whole photo is just so clever and loving, all done to show Randi that he was missed. I wrote to Randi as soon as Ross sent me the finished photo. I told him that we saved him a chair and expect him to be at CSICon next year, front and center. I’m always very touched by any such expression. This is certainly no exception. You have my sincere gratitude. I suspect, however that a couple of those beards were fake. But I’m in a forgiving mood at the moment. I’m frankly very touched. I’ll see you at the next CSICon. Thank you all. -James Randi. As a photographer I must say that I love both photos; I feel happiness, sentiment and affection for everyone in this photo. I love zooming in and looking at each of these faces, capturing a moment in time. A moment when we all squished together to salute Randi to let him know he is loved and missed. I haven’t been in either of the photos, and don’t plan on being in the future ones. I do hope there are future photos. Meet me at CSICon 2018, Las Vegas Westgate Casino, October 18-21 and don’t forget to pack your Randi beard, or come up with a clever substitute. Hopefully I’ll be there, standing on a table on top of the stage; you won’t miss me, I’ll be the one with the camera. Thank you all for making this photo possible. And thank you to Stuart Jones for proofreading and comma insertion for this article.